It’s National Chocolate Cake Day! Of all of the food holidays that exist, this one is pretty high up on my list of ones that I’d like to celebrate. Who doesn’t like chocolate cake? Cheesecake: yum. Pie: great. Cake: meh. See, it’s not always easy to get the right ratio of frosting to cake, which can leave a cake rather dry. I’ve experienced more of those in my life than I can count. So while cake may not be my first choice, this cake isn’t included in that category. Well, it’s kind of like a cheesecake, but mainly because it has a whipped topping frosting. Italian Love Cake needs to hang out in the fridge to cool completely before you can add the frosting and then it needs to go back into the fridge so the frosting can set up, so it’s best made the day before. 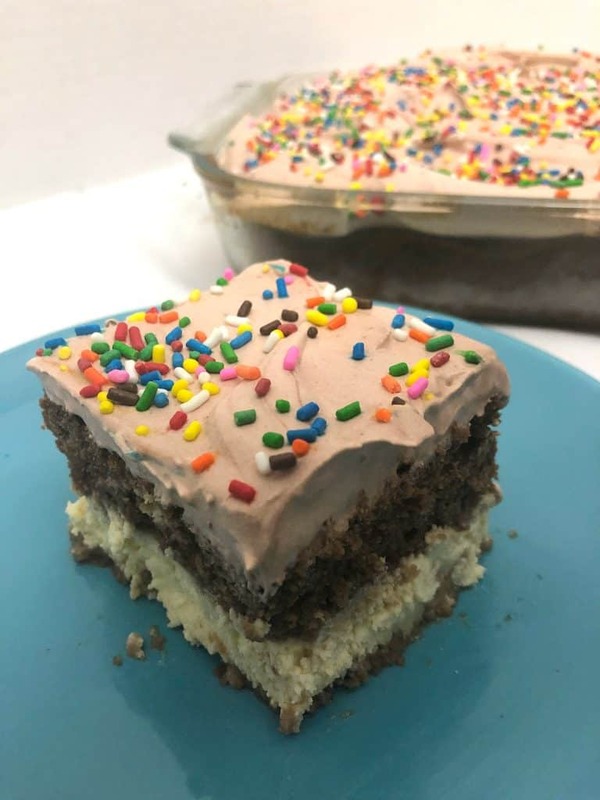 One of the coolest things about this cake is the chocolate cake layer and ricotta layer switch while you’re baking it. To be honest, I was skeptical of this. How do you start with chocolate cake batter on the bottom and a ricotta mixture on the top and then they flip flop? Without getting into science that I can’t explain, I’ll just say that I know it has to do with the weight of the layers. As in, cake batter is much lighter than a ricotta egg mixture. Don’t quiz me on this, please. And if you know the actual scientific reason, please feel free to share it in the comments! Don’t freak out if you take the cake out of the oven and it doesn’t look like the layers switched. Mine didn’t look like they did at all and there was even a deep crack down the center of the cake. I knew I could hide with the frosting, but how was I supposed to explain a three layer cake that wasn’t three layers? Turns out I didn’t need to worry about it, because as soon as I sliced into the cake, it was obvious the layers had switched. Yet appeared not to on the outside. We’ll just call this baking magic, okay? 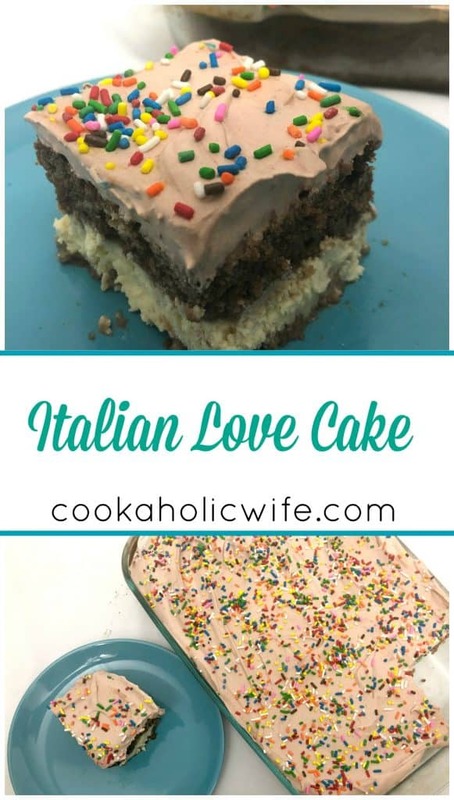 Italian Love Cake is a delicious make-ahead cake, similar to cheesecake but includes three layers: chocolate cake, ricotta and a whipped topping frosting. 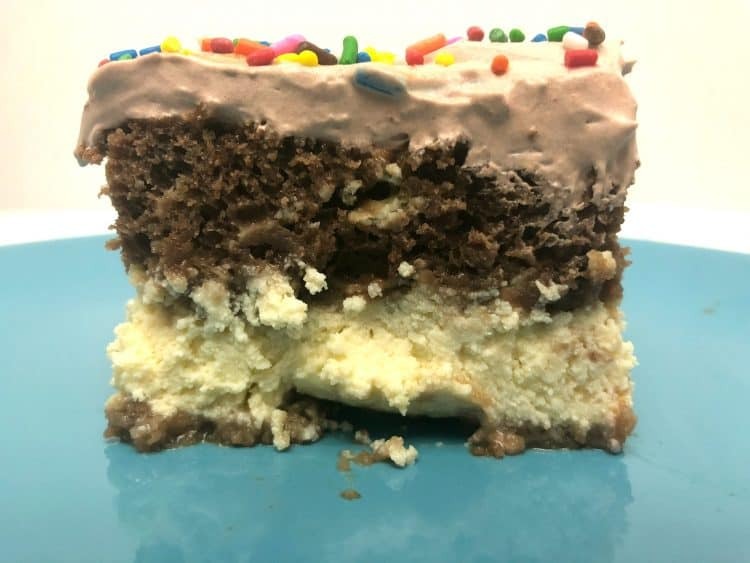 Combine cake mix and ingredients on the box to prepare cake batter. Add ricotta cheese, eggs, sugar and vanilla to a bowl. Whisk to combine. Pour on top of the chocolate cake batter. Transfer baking dish to the oven and bake for 1 hour. Cool on the counter for 1 hour, then cool in the refrigerator for 1 more hour. Prepare the topping by whisking the pudding and milk together, then folding in the whipped topping until fully combined. Spread over the top of the cake and decorate with sprinkles if desired. Refrigerate for at least 4 hours, but preferably overnight before slicing and serving. 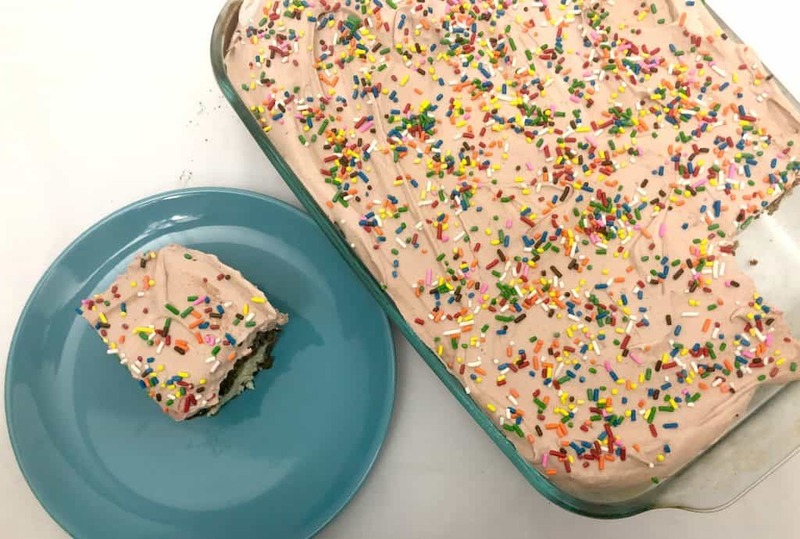 This cake was just begging me to add sprinkles to it. There’s not a whole lot you can do with a whipped topping frosting to make it look decorative, so the sprinkles made it a bit prettier. You could also use all chocolate ones in keeping with the flavor profile of the cake. 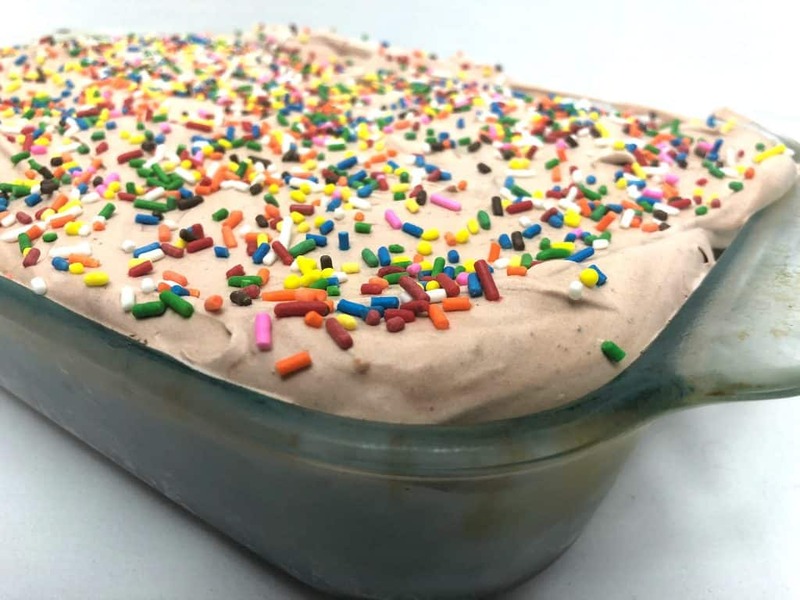 Or if you were making this for a holiday, add some holiday themed sprinkles on top. Crushed up chocolate cookies could be delicious too. I don’t think you can go wrong here. A bunch of the Festive Foodies have also made chocolate cakes to share with you on this National Chocolate Cake Day. Check out what they have made! Looks delicious and with a name like Love Cake it is perfect for Valentine’s Day. I love recipes like these. So fun and tasty! Sounds and looks like pure magic. Thanks for joining me.